Medicinal Practices of the Aztecs Research Papers study the understanding of medicine in their culture. Research papers on the medicinal practices of the Aztecs focus on the early civilization and their use of nature to heal. Paper Masters custom writes projects on alternative medicine, the history of medicine and various civilization's use of nature to cure sickness and disease. Because of the lack of a written tradition among the Aztec empire that allows a full reconstruction of their society, the understanding of their medicinal practices are primarily based on the writings of European observers and archaeological evidence. As a result, there remains a degree of controversy regarding the exact nature of Aztec medicinal practices as well as the understanding of medicine in their culture. While the evidence indicates that the Aztecs employed a wide variety of medicinal herbs in the treatment of disease and infirmities that have a measure of effectiveness by modern standards, the relationship between priests, religion, women and healing in Aztec society remains unclear. Some historians and modern herbal practitioners contend that Aztec medicinal practices were incorporated into the post-Aztec Hispanic culture of Mexico and continue to be followed today. This position, however, does not conform with the anthropological understanding of the process of syncretism that occurs when cultures merge, which makes it difficult to sort the traditional Aztec practices and medical perceptions from those that developed in the years after the Spanish conquest due to the interaction of Aztec and European cultures. 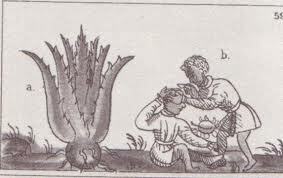 Much of the direct knowledge that we have regarding Aztec medical practices comes from an illustrated treatise known as the Libellus, written in Mexico City at the Colegio de Santiago de Tlatelolco in 1554. This was after the fall of the Aztec Empire to the Conquistadors, but sufficiently close to the event to be regarded as a contemporaneous source. It was written by a Native American scholar at the College, and presumably was tainted by the European perception that the Aztec medical practices were akin to witchcraft and superstition. This European concept was particularly emphasized in the spiritual healing aspects of Aztec medicine. While the majority of medicinal preparations were derived from plants, the Aztecs also used pastes and potions made from insects and even from snake venom. This suggests that the Aztecs had a highly developed understanding of the way that natural substances interacted with the body and had developed a wide body of medicinal lore. Violence in Aztec Society - Violence in Aztec Society was committed daily with numerous, painful sacrifices to provide human blood offerings to their war god Huitzilopochtli. Shamanism Research Papers explore the duties and roles of the medicine men and women, and how to become a shaman. Urban Archaeology - Urban Archaeology research papers examine the sub discipline of the field of archaeology that specializes in the analysis of material artifacts from cities and towns. Archaeology - Archaeology research papers examine the study of human activity from the past, that is carried out through the recovery of artifacts. Paper Masters writes custom and on Medicinal Practices of the Aztecs Research Papers study the understanding of medicine in their culture.